The lens looks fantastically sharp. Too bad I can't justify buying it at its price. How good is it for portraits? It would be nice to have a couple of portrait samples there. Well, I broke down and bought the lens before your review! I simply love macro. The lens is big and heavy (for a mirroless camera system), and does all kinds of funky noises when active, but it takes stunning pictures. 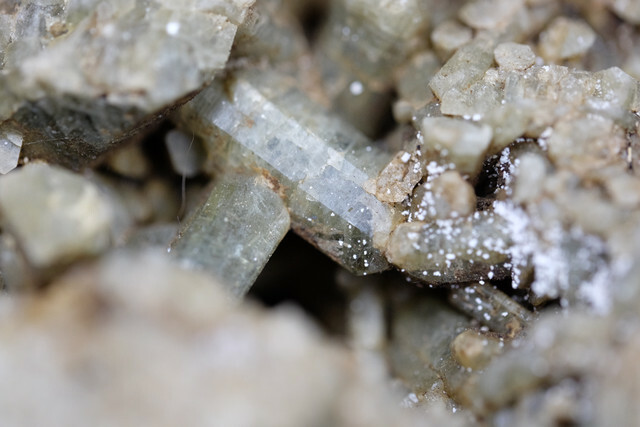 Diopside from Morin Heights, Qc, taken handheld at 1/80s with Fuji X-T1. Yep, makes all kinds of strange noises. I blamed it on the stabilizer first, but the noises remain even when it is switched off. Maybe the same lens group takes care of both AF and stabilization. When without power, it rattles just like the XF 90. One more sign of life from me: review for the XF 80 scheduled for Sunday or Monday. Further XF lenses in the pipeline: Zeiss Touit 50, the XC 15-45 and I'll try to get some sample images with the XF 8-16 this weekend (if weather permits). And then Nikon, of course... the D850 is here for a while already, I'm currently also investigating options to get my hands on a Z7 kit without having to pay the full retail price. Obviously, I am quite curious about the new systems and new lenses. But, for the amount of money I'm paying for this website (none at all), I can't really complaint about the hiatus. Real-life happens sometimes. Totally agreed: there is zero reason whatsoever to complain! Markus, Klaus (and Seb?) do the reviews during their free time and we don't pay a dime for it. I think it is just Klaus and Markus now?